The Lady at Office Max said her ex-husband (computer-geek-gone-truck-driver -- don't ask) calls his Maggie. But we call ours Madge. 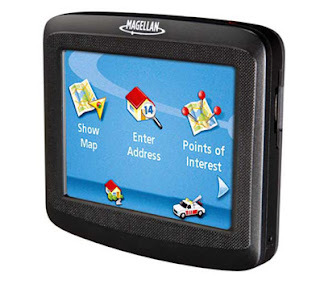 I'm talking about the Magellan RoadMate GPS, of course. This little beauty has replaced me as the official direction-giver. Let me explain - before I started working full-time (and during the summer months), the Man Beast would call me no less than a gazillion times a day asking for directions. This week, he started a new route, and is completely clueless as to where he needs to drop off packages. Last night, we visited Red and Shellbell. We stopped off at Office Max (as well as Circuit City) to price GPS systems. We settled on this one - it was on sale (but still ridiculously priced). Coming home, we put in our home address and just to mess with it, Man Beast took alternate routes. Would you believe that bad boy (bad girl?) rerouted as Man Beast took wrong turns? When we got home, he got his Handy Dandy Notebook (spiral, not electronic) and sat in the car (GPS works only because of satellites, don't you know) and routed his route for today. All in all - very cool, Madge. Very cool. My Man Beast is a gadget freak. But then again, I tend to be one, too, so it's okay.